I have been a teacher for 30 years, a Headteacher for 15 years and, at the age of 53, this much I know about different perspectives, flexible working practices, and Carlos Alberto. We all have our points of view. As an English teacher, I used to loathe multiple-choice questions until Daisy Christodoulou helped me see things from a different perspective. Colleagues on our city’s Independent-State School Partnership helped me overcome my stereotypically prejudiced view of independent schools. 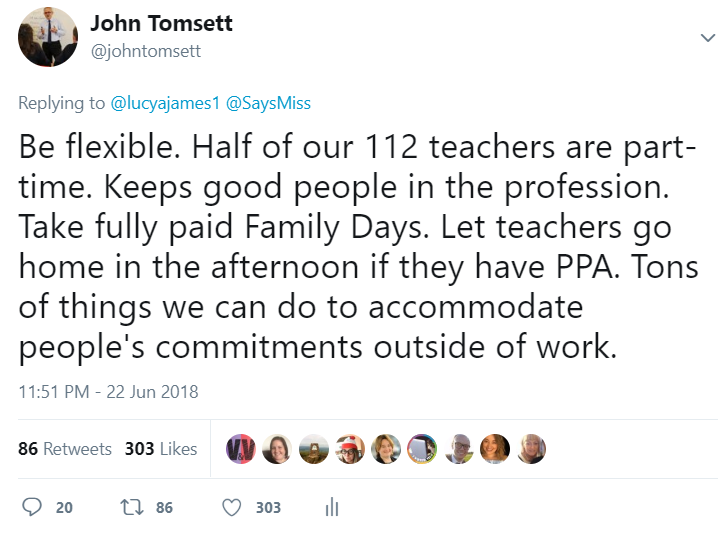 When I first became a head teacher, over 15 years ago, I automatically considered part-time staff to be a timetabling constraint which created too many split-classes and merely disadvantaged students. Fifteen years on, nearly 50% of our 112 teachers have part-time contracts, because it is one of the most effective ways to retain our best classroom practitioners. And two truly great part-time teachers are far better for our students than one average full-time teacher. There is a big appetite for more flexible working practices in schools. As the number of likes suggests, since I tweeted about workforce flexibility late last night the response has been emphatic. It seems that there are still many school leaders who are failing to see the benefits of flexible working practices; considering the current recruitment and retention challenge in schools, they might look again at the advantages of family-friendly policies such as part-time contracts and flexible starting times. Without claiming causality, it is a fact that since 2010 we have employed increasing numbers of part-time staff and our students’ outcomes have improved significantly over that same time period. Looking at an issue from a different viewpoint can give you a fresh perspective. If you hadn’t noticed, it’s the World Cup; as you will see from the two videos below of Carlos Alberto’s sublime goal against Italy in the 1970 World Cup Final, there is more than one way of looking at things. The problem is that we’re not training enough teachers to sustain this. If we move to a situation where teachers are commonly on 80% or under timetables then we need a lot more of them. The argument is that it stops people leaving the profession – and I buy this, to an extent. At present we don’t know if the extent to which they will stay is higher than the extent to which they will go part-time. That’s my worry. 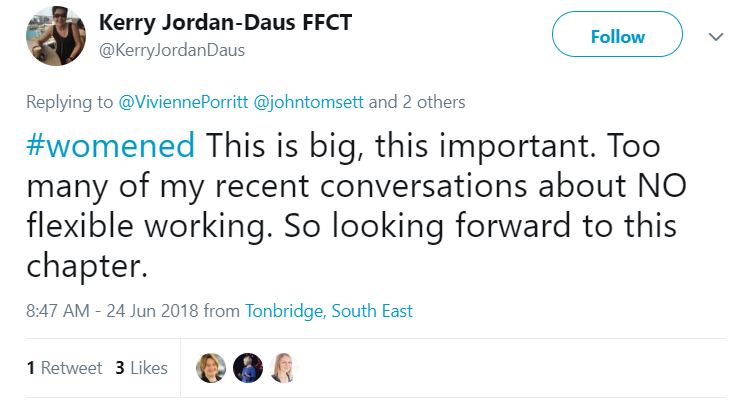 I’m also concerned that if the profession is dominated by people who are part-time, but they work outside of hours to make up for the fact they can’t do the job during worktime, then those people who can’t afford to drop downin hours will get completely screwed (because they can’t do the full-time job AND all the extra stuff) and then will also leave. So, in an ideal world, part-time is good. In schools which have everything together, I don’t doubt that a lot of staff could be part-time. But, as an entire nation, if we have lots of people go part-time without thinking about what that means for wages, full-timers, and the numbers that we need to train, we could end up in a pickle in the long-run.